Suitable from birth with flat reclining seat! Pairs perfectly with all Joie infant seats! One second, one hand 3D fold! Smooth recline system ensures you won't wake a sleeping baby! Multi-position calf support gives two comfy options! Meet Brisk LX. A spontaneous sidekick in the brisk family, loaded with even more luxury. Packed with all the perks of a full sized stroller in a compact, 3D package. Infant Friendly Lights out flat recline, super shady extendable canopy, and SoftTouch harness welcome the tiniest riders. 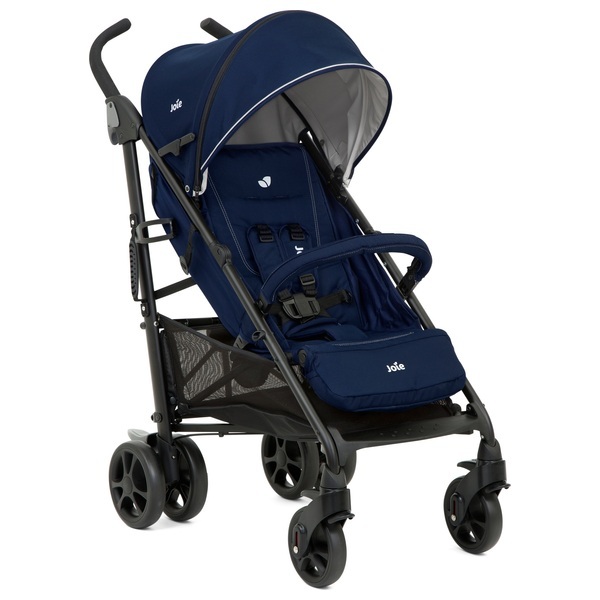 It also includes a UPF 50+ sun canopy, removable bumper bar with fabric cover, Raincover and Footmuff! Simple System Pairs with all Joie infant seats in a snap to create an effortless travel system - no adapters needed. SoftTouch 5-point harness system with shoulder harness covers is gentle on baby's skin and adjusts to 3 heights. The Joie Brisk LX - Midnight Navy Pushchair features a large, expandable hood with viewing window and retractable visor provides custom shade options for baby! EU Warning: It is recommended the most reclined position is used for new born babies. Always use the restraint system. Never leave your child unattended. Ensure all locking devices are engaged before use.